This post is really interesting especially since I can relate about my pale friends constantly complaining about how they wish they were tan. I’ve always known that tanning beds are not the way to go. It’s important to love yourself and the skin you’re in especially when fake tanning can have such a negative effects on your skin. I found a really interesting article that examines why some people depend on tans more than others based off of ethnicity, age and more. Your post speaks to me. Why? It’s not because I can’t tan. I’m 100% Italian, so I really haven’t experienced a pale skin time. It speaks to me because I constantly have to worn some of my friends to STOP FAKE TANNING. Several studies have surfaced revealing results that prove tanning beds DO IN FACT INCREASE YOUR CHANCES OF GETTING SKIN CANCER. And yet, somehow, people still willingly spend $30-$45 a month to get that crispy golden brown tan. Well, what you’re probably getting with that tan is a side of skin cancer people. You’re thinking, “oh, one time can’t be that bad, right?” Well, it is. Several studies have shown that absorbing UV rays from intensified bulbs in a short amount of time JUST ONCE, yes, is enough for your body to develop skin cancer. Lying under the sun for a long time and absorbing its UV rays is bad enough. So what makes you think intensifying those rays and shortening the amount of time it takes to absorb them is somewhat better for you? IT’S NOT. These are all things I have warned my friends about, and they still have yet to listen knowing these scary facts. Overall, I think your post is well written, supported, organized, informative, and a great choice of topic to share with the class. Great job! I relate to you, Randall, because I also have ancestors with darker skin, making me less inclined to sympathize with those who complain of pale skin. I cannot understand why someone would up their risk of cancer simply for appearance! I’ve seen similar crazy statistics and try to understand how a person could just ignore them. Melanoma is more often than not preventable. These people value meeting society’s standards of beauty over their own physical health, which is flat out ridiculous. I’m wondering if it’s possible to treat tanning beds the same way we treat cigarettes. http://www.cnn.com/2015/06/03/health/tanning-beds-legal-age/ Here is an interesting article discussing tanning and minors, and making it more difficult for people to begin this horrid habit at an early age. The most striking statistic seen in this article is one I hear about so often: “Just one indoor tanning session increases users’ chances of developing melanoma by 20 percent compared with that of someone who has never tanned indoors.” Yikes. I can relate to this blog because melanoma runs in my family. I was always told to lather up with sunscreen at least twice on a sunny day. The UV rays are extremely strong and can easily cause cancer especially when melanoma already runs in your family like mine. Tanning has become an increasing problem because young woman feel the need to constantly keep a dark skin shade throughout the year, especially summer. Tanning beds are extremely dangerous and people who first use a tanning bed before age 35 increase their risk for melanoma by 75%. I discovered an article discussing the risk factors of skin cancer and certain methods to prevent it: http://www.skincancerprevention.org/skin-cancer/risk-factors . Overall this was a very interesting blog and but cancer is an extremely serious thing so stay away from those tanning beds and cover up with sunscreen on sunny days. I agree with you, I have always thought that tanning in a tanning bed is stupid, and you are unnecessarily putting yourself at risk for skin cancer. 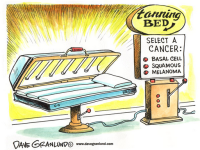 This blog post only strengthens my belief as I now see there is scientific backing to an increased risk of skin cancer, it makes me question the motives of people who tan in tanning beds even more. Because the risk is so high, I wonder if the government should do something to discourage people from tanning in tanning beds so frequently. The healthcare cost of dealing with these skin cancers is most likely very high and therefore the government could save healthcare money by dealing with this issue at the source. Maybe if tanning was more expensive, like the taxes imposed on cigarettes, people would be less likely to do it as often, or even at all?